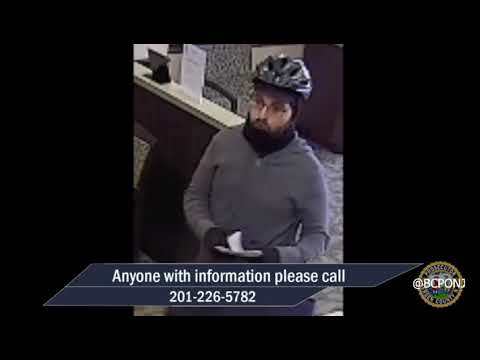 FORT LEE, N.J. -- Fort Lee police released surveillance images Monday night of a man who robbed the TD Bank on Palisade Avenue earlier in the day. He struck at 4:26 p.m., passing a note to a teller and taking an undisclosed amount of cash, fleeing on foot, Detective Capt. Patrick Kissane said. Police established a perimeter, but he escaped. Palisade Interstate Parkway Police, the US Postal Inspector’s Office, New Jersey Transit, Weehawken police and the Port Authority police assisted. The Bergen County Sheriff’s Bureau of Criminal Identification collected evidence. Fort Lee police and the FBI were investigating. They asked that anyone who sees, recognizes or knows anything about the man in the photos to immediately contact Fort Lee Detective Dennis Conway at (201) 592-3510 or police headquarters: (201) 592-3700.